I'm not doing very well am I? Second post and no disgustingly glorious clothing to show off yet. That's the price you pay whilst waiting a month for your eBay items from Hong Kong to show up. Anyway it's PANCAKE DAY. I was totally unaware until Lucy Piped up at work. Straight away I was on the phone to Jim asking if we could cook up some concoctions of our own for tea. I am now disgustingly full. Like ready to pop full of pancake goodness full. 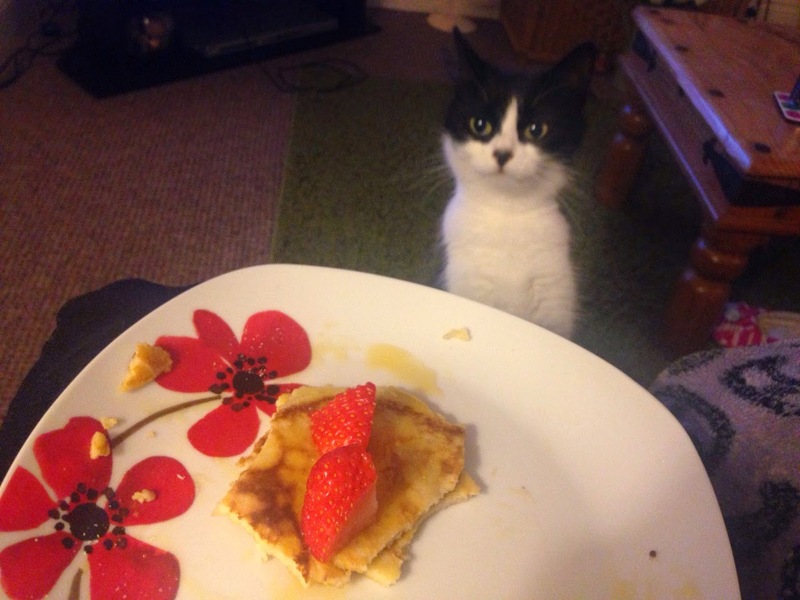 ''Can I haz some?!' LOL below is Cassandra cat. She always needs to have whatever it is I have or what I am eating. She's my best pal, I'm guessing she will be popping up on my blog a lot. So to concldude, what are you guys going to give up for lent? ever tired it before? Who am I even talking too?